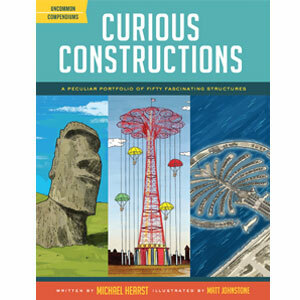 Inside this book, you'll come face-to-face with 50 incredible structures, including: a fire-breathing octopus sculpture; the skateboard ramp you'd need to jump the Great Wall of China; a whole community of tree houses in Costa Rica; and a lifesize X-Wing Starfighter built of Legos." Click here for more information. Extraordinary People is a decidedly incomplete compendium of excellence from all fields of endeavor. In brief bios, fascinating facts and illustrious illustrations, you will learn about 50 of history’s heroes and heroines, both unsung and sung. Click here for more information. For those of you are not quite old school (vinyl above), but also not quite new school (iTunes), you can also purchase a CD. Songs about some of the world's most fascinating individuals! Including Stagecoach Mary, Ibn Battuta, Jane Goodall, and Lawnchair Larry. With guest vocals from Tanya Donelly, Taylor Mac, Olivier Conan, Claudia Gonson, and Allyssa Lamb. Click here for more information. 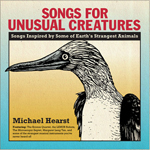 With humor and flair, Michael Hearst introduces the reader to a wealth of extraordinary life-forms. 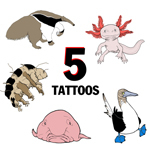 Which animal can be found at the top of Mount Everest? Which animal poops cubes? 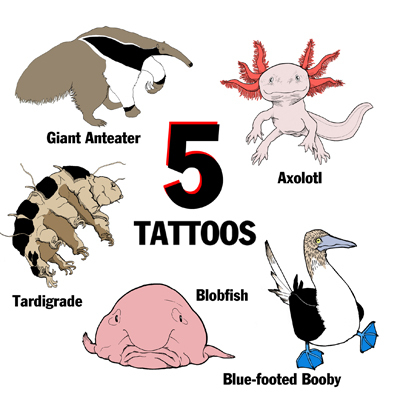 Which animal can disguise itself as a giant crab? It’s all here! Click here for more information. An album of instrumental songs for kids AND adults, featuring the Kronos Quartet, The Microscopic Septet, Margaret Leng Tan, the LEMUR Robots, and some of the strangest musical instruments you’ve never heard of! Click here for more information. Special import! 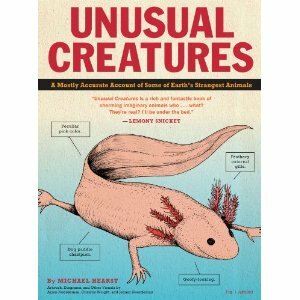 The French translation of Unusual Creatures. Un festival de drôles de bêtes, aussi surprenantes qu'attachantes! Click here for more information. Its estimated that one in five people have a fear of flying. Michael Hearst is one of those people. Herewith, is an album of relaxing music for the nervous passenger. Click here for more information. Are you tired of hearing the same two or three ice cream truck songs over and over? Michael Hearst certainly was. Thats why he created an entire album of NEW songs for ice cream trucks. Click here for more information. 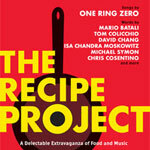 Featuring essays, interviews, and recipes from David Chang, Chris Cosentino, Mario Batali, Isa Chandra Moskowitz, Michael Symon, Mark Kurlansky, and many more. The recipes have been set to music and sung WORD FOR WORD in the musical style suggested by the chef! "As Smart As We Are, births the equation Atwood + Auster + Eggers + Lethem + Moody and the like + One Ring Zero = A BEAUTIFUL SHEBANG OF LITERARY AND AURAL MISCHIEF." -The Village Voice Click here for more information. Need help with your order? Want something signed? Just email me and let me know!